I love this episode. It’s probably not my favorite episode of Scrubs (they have some fantastic ones), but this one is just great. What’s funny, though, is that, despite how many times I’ve seen it, there are a lot of things I don’t remember. At least, I forgot that certain plots were part of this episode in particular. For example, take JD’s mistake while taping the birth of the new baby. First, I always wonder why Cox wouldn’t tell JD to replace the tape (if someone handed me a camera, I would figure that it was ready to go). But second, I completely forgot that there were two baby stories in this one episode. I thought this stood on its own elsewhere in the Scrubs canon. But this isn’t really the story that makes me love this episode (clearly, if I forgot it). But before I get there, I wanted to mention Elliot. She’s another one that I forget about this episode. Her quest to prove that she’s not another woman that’s going to move to pediatrics or gynecology. Because of this stubbornness, she turns away a troubled girl who needs to have her child immediately. Which all leads me to Turk. Turk’s doubt of God in this episode is really what I love about this episode. Not the doubt in particular, the how much of his story feels like a real Christmas story. After seeing so much violence, pain, and hopelessness on Christmas Eve in the hospital, Turk has doubts about his faith. But in one of the best moments in the episode, Turk sees a shining light in the sky that makes him run — RUN — to the park, just in time to help the young mother give birth to her Christmas child. I don’t know why, but Turk’s running always gives me goosebumps, even thought it’s slightly comedic in how dramatic it was. Yeah, even the group found that one cheesy. So we leave the show with the characters we love just as they were, a bunch of friends teasing each other this bright and shiny Christmas season. Recommendation: Definitely watch this episode at Christmastime. It will get you in the spirit and make you laugh at the same time. Plus, it’s one of the few episodes that has religious undertones. And sometimes that’s just nice to see at Christmastime, you know? Boo. Gross. The start of another week? Who wants that? Well, here at Raked, we think your Monday should rock. At least today. So to start your week off right, we’re here to make that happen. Well, maybe more accurately, Turk and the Crew are. After all, here they are, rocking “More Than a Feeling” with their airband. Enjoy the tune. We’ll try to fill in a few more of your Mondays with some good tunes, and in case you like this one, go ahead and buy the CD! That’s Boston, of course, not Turk. Tonight is a night that no one on Grey’s Anatomy will ever forget. It’s the night that their careers will be forever tainted because they participated in Grey’s Anatomy: The Musical Episode. You know, I really wish I were kidding. But no. This show, that strives to be a dramatic representation of a hospital — no quirks, not fantasy, no make-believe — is doing a musical episode. Now, before you picture McDreamy dancing up and down the hallways, I don’t think it’s that extreme, but in a show like this, a musical episode just doesn’t fit, and I find it incredibly dumb. It’s a stunt, just to get people to watch. What is the stupidest TV rating stunt you’ve seen? This can be cameo appearances or guest stars. Ridiculous plotlines. “Live” shows (we can thank ER for starting that trend). Fantasy or dream episodes. Heck, even musical episodes. Actually, I think hospital shows tend to fall in this category a lot. I mean, ER had a helicopter chop off someone’s arm, only to have him recuperate and die once another helicopter fell on him. Grey’s Anatomy had an episode where a bomb was in someone’s chest. But it’s not just drama that can do too much. 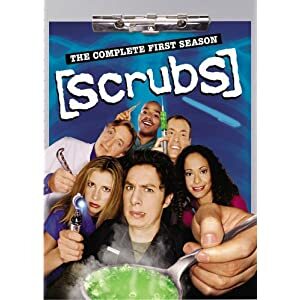 Scrubs once did an episode where everyone was some fantastical, medieval character, and Turk and Carla were a two-headed monster. Every time I see that episode rerun, I change the channel. Or what about soaps, when we had the serial killer on Days of Our Lives, only to have them all be alive on some secret island (or was it a room? I forget). Anyway, there are some stupid stunts on TV, and while they may not all be during sweeps, they are all to get people to watch. So which one bothered you? Let me know in the comments. Don’t these people know that’s why you do musical theater while you’re on hiatus? Bah. Yesterday as I was driving to work, I rocked out to Gavin DeGraw‘s “I Don’t Wanna Be” on the radio. It got me thinking, of course, about One Tree Hill–not only because it’s the theme song (though I love how they’re incorporating various covers of the song every week), but because One Tree Hill really made a solid effort to support Gavin DeGraw, much like they’ve done for Kate Voegele and Wakey Wakey. In fact, when I hear “Almost Everything,” I can only think of the OTH character and his finishing the album to get over his unrequited love. Or “Brooklyn” and the OTH promo that used it. So what songs or artists remind you of shows? It can be a fun or painful question. Painful, why? Well, let’s just say that every time I hear “With or Without You,” I think of Rachel looking lamentingly out her apartment window on Friends. I don’t generally like to think of Ross and Rachel out of any famous TV couple. On the other hand, I love Joshua Radin and Colin Hay’s “Overkill,” and I love that both of them remind me of Scrubs. It’s funny. Some of these songs don’t even play important roles in the shows, but I still think of them. It doesn’t have to be a theme song to remind you of something, you know? So what’s on your TV soundtrack, and what show does it remind you of? It can be a promo, episode montage, or hey, I’ll even throw in a theme song. After all, do any of you not think of Dawson’s Creek when you hear “I Don’t Want to Wait”? Now, I put a TON of links up there to artists and even clips, so instead of an image, how about something adorable and cute? Unrelated to the show, they just put this up as a cold open. Love it. A few years ago, there was a good stream of musical episodes. Buffy, Scrubs–just to name two of my favorites. There was a slight renewal in musicals this spring when FOX was hyping Glee, but why not ask for more? What show would you like to see a musical episode of? Now, Eli Stone would have been a natural choice, but it’s not on the air anymore (and in some episodes, it was pretty close). But now, if I could choose, I think Drop Dead Diva could pull it off, even if it was a dream. They had some great fun in the season opener, and frankly, Brooke Elliot has a fantastic voice. Even Margaret Cho got to sing. Plus, they’ve got two ex-dancers in the cast, so it’s just adding up to some fun. What about you? Or would you want to see any at all? I’ll leave you with some fun YouTube clips of some fun TV musical numbers. Not too many, but a couple. Ok, this might pain some of my male readers, but here goes nothing. I’m actually attending a friend’s wedding tomorrow–as a bridesmaid, no less–so I’ve got weddings on the brain. Plus, there are sites everywhere spouting spoilers about possible engagements on upcoming season finales (or in the episodes leading up to them), and heck, it’s a major plot point in Life Unexpected, among other shows–who’s not being bombarded? Add in the fact that NBC has two hours of the Pam/Jim saga on tonight (er, I mean, The Office), one of which is the wedding episode, so it’s all weddings weddings weddings all over TV. I mean, when we’re nearing the end of a season, it’s time for weddings or character deaths, so let’s focus on weddings! What’s your favorite TV wedding episode? I have to say, I recently watched a rerun of Turk and Carla’s wedding on Scrubs and I forgot how funny that episode was. And, of course, I have to give a shoutout to Buffy just because Anya’s dress choices were just that humorous (even if the episode might not be all happy-go-lucky all the time, but hey, that’s Buffy). But really, my vote goes out to an oldie but goodie. We’re talking Cass and Lila on Another World. Yes, a soap. It was the series finale of the show, and Cass gets kidnapped by a gorilla and held hostage in a tree. In order to get the gorilla to let go of Cass, the cast has to sing “Get Up Offa That Thing” to her. You think I’m making this up. I’m not. So yes, folks, that one gets my vote. I was really trying to find video or images from that gorilla scene on Another World. Sadly, since it was in the 1990s, of course, there’s little online. But really you just had to see it. In fact, I think I still have it on VHS somewhere.